Get Your Garden And Lawn The Soil Treatment They Deserve By Simple Grow Solutions - Starting Today! Root Hume is an ideal solution for any garden or lawn owner, plant or flower lover and anyone that loves their flowers, trees or bushes! Thanks to it being obtained by a Proprietary Extraction Method, instead of being simply made from soluble powder, it is of high end quality and is also considered organic! Reduce Your Fertilizer Costs & Boost Your Plant Growth! 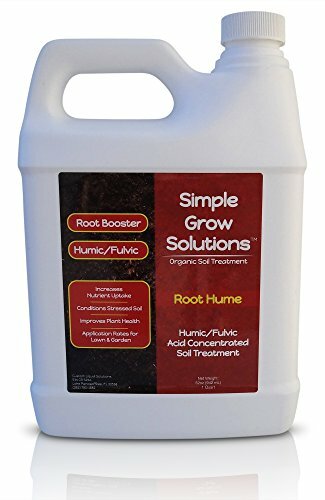 Root Hume increases the fertilizer transfer, as it prevents excessive leaching away from the root zone and releases it the way it is needed - hence making it much more cost effective for you. In addition, it releases various types of auxins that are responsible for and boost your plants' growth! Increase Organic Matter & Nutrient Uptake! This exquisite humic/fulvic acid soil treatment significantly improves the development and growth of various beneficial micro-organisms groups, as well as it increases the permeability of plant membranes, thus strongly affecting their nutrients uptake percentage! Our product conditions stressed oil, by allowing the crop to handle stress of a Ph problem, until it can be properly corrected! Earning your clients' trust and loyalty is not an easy goal to achieve. That's why, at Simple Grow Solutions, only offer you premium quality products that are created via the best production processes - to make sure they rise up to your highest expectations! Place Your Order Now For Your Own Root Hume Soil Treatment - Before Our Stock Vanishes! Application Rates For Lawn & Garden: Use on Turf grass, Flowers, Hardy trees, Young plants, Tomatoes, Vegetables, Fruit, Citrus, Flower beds, Bushes, Potting soil and More. Reduce Fertilizer Costs: Increases the transfer of fertilizer, Enhances nutrient uptake, Boosts plant growth and Encourages organic matter. Soil Conditioner: Conditions stressed, damaged, and compromised plants and lawns. Produced In The United States: Root Hume is manufactured in the United States of America, by a family owned business with 24 years of former experience in the agricultural field! Intense, Concentrated Liquid Treatment: This Quality Super Booster goes a long way! High Quality Natural & Organic Food Grade Ingredients. If you have any questions about this product by Simple Lawn Solutions, contact us by completing and submitting the form below. If you are looking for a specif part number, please include it with your message.